Missouri Republican Senate candidate Josh Hawley is holding a string of last day rallies leading up to President Trump’s appearance partially on his behalf Monday night at nine in southeast Missouri’s Cape Girardeau. The late-night gathering in front of as many as 7,000 people at the Show Me Center on the campus of the Southeast Missouri State University is the President’s last stop before the election on a whirlwind of rallies across the country in the closing days before the election. A rally in Springfield early Monday morning in which Hawley was joined by top Missouri Republicans including Governor Mike Parson and U.S. Senator Roy Blunt was followed by a similar event at the state Republican Party Headquarters in Jefferson City where he appeared with four GOP statewide officeholders – Lieutenant Governor Mike Kehoe, Secretary of State Jay Ashcroft, Treasurer Eric Schmitt and Senator Blunt. 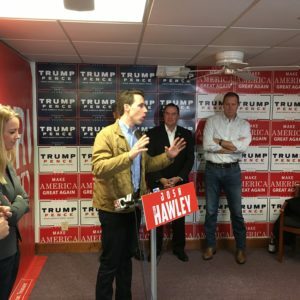 Hawley also scheduled two additional rallies at GOP Field Offices. One in Blue Springs near Kansas City was to include Parson, Blunt, and Schmitt at 12:15 p.m. The other in St. Louis at 4:15 p.m. was to feature Republican National Committee Chairwoman Ronna McDaniel, Parson, Kehoe, Schmitt, and Congresswoman Ann Wagner. McDaniel appeared on CBS’ Face the Nation and CNN’s State of the Union with Jake Tapper Sunday, where she defended President Trump’s focus on immigration and fear of undocumented migrants rather than on good economic numbers that have recently been released. The tough talk on doing away with birthright citizenship, the process by which babies born in the country automatically become citizens and blocking a caravan of migrants headed to the southern border, is thought to be helpful for GOP Senate candidates running in states won by Trump such as Missouri. Hawley spent more than and minute-and-a-half minutes of his roughly eight-minute address before supporters in Jefferson City talking about border security. He chastised Democratic incumbent Senator Claire McCaskill for calling Trump’s border wall embarrassing and claimed she voted against border funding. McCaskill and her husband run the Shepard Family Foundation which has been criticized by Republicans for making donations to abortion provider Planned Parenthood and a foundation that has Russian ambassador Sergey Kislyak on its board of directors. Kislyak’s meetings with personnel in President Trump’s administration have been part of special counsel Robert Mueller investigations into Russian meddling of the 2016 American election. Two years after the 2016 election, a frequent chant at the President’s campaign-style rallies has been the phrase “lock her up” when he mentions the Clinton Foundation or her use of an unsecured email server. Hawley also accused McCaskill, who voted against the confirmation of now Supreme Court Justice Brett Kavanaugh, of being part of a campaign with Democratic leaders to discredit him. “She was with Nancy Pelosi and Chuck Schumer and Diane Feinstein every step of the way in the Kavanaugh smear campaign,” Hawley said. The Missouri Democratic Party and Senator McCaskill’s campaign have not responded to Missouirnet’s numerous requests for comments on Hawley’s statements. Over the weekend in St. Louis, McCaskill said Hawley is misrepresenting her as a liberal when she’s really a political moderate. She also Hawley’s tight embrace of President Trump is a double-edged sword that does not play well in places such as St. Louis. Three polls were released Monday morning. Two of them favored McCaskill while one gave the edge to Hawley. All three were within the margin of error. An Emerson poll gives Hawley a three-point lead, 49%-46%, while surveys from NBC Marist and HarrisX favor McCaskill by three points, 50%-47%, and one point, 46%-45% respectively. GOP Lieutenant Governor Mike Parson expressed confidence in Hawley’s chances in the race at the Jefferson City rally. “This is a long-fought battle,” said Kehoe. “I think it’s going to break toward General Hawley and I think he’ll be our next U.S. Senator.